iPod accessories maker XtremeMac this week unveiled a voice recorder designed for the fourth-generation iPod nano. 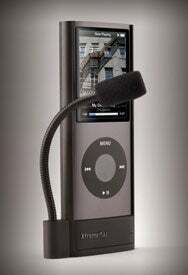 The XtremeMac Micromemo, which connects to the 4G iPod nano through the dock, captures voice recordings with the help of flexible and detachable omnidirectional mic. You can play back recordings through the Micromemo’s speaker and save them as .wav files. Powered by the nano’s battery, the Micromemo’s controls show up on the iPod screen. Recording times appear on the screen, while an illuminated recording status indicator lets you know when you’re recording. Because the Micromemo’s microphone is detachable, the device can accept other mics with a 3.5mm plug. It can record audio straight from a computer or soundboard thanks to its line-in capabilities. XtremeMac says the Micromemo for the 4G nano will ship in March. It will cost $50.